This deliverable analyses the regional impact and distribution of migration and crossborder commuting in the EU27 using European Labour Force data. Furthermore a case study of migration and commuting potentials in one of the border regions, which can be deemed to be most affected from these flows (the border region of the new member states to Austria) is conducted by using the first two waves of the LAMO household survey conducted in the CENTROPE region in 2004-2005 and 2006-2007. With respect to the regional structure of migration in the EU we find the largest local clusters of migrants in the EU 15 in the Ile de France as well as Inner and Outer London and a markedly different settlement structure of migrants relative to natives: 23.9% of all migrants would have to change their region of residence in order to achieve a uniform distribution of migrants across EU-15 NUTS 2 regions. Migrants from the NMS-8 show a lower degree of concentration than those from Bulgaria and Romania or the candidate countries, while they are more regionally concentrated than migrants from other countries. The biggest local clusters of NMS migrants can be observed in the London areas and Vienna. Looking at individual sending countries, Polish migrants show the lowest tendency to cluster regionally among migrants from the NMS. Furthermore, low skilled migrants with primary education are much more spatially concentrated than migrants with secondary or tertiary education, which confirms earlier findings. The concentration of migrants did not differ substantially between migration cohorts: those who moved during the last 10 years are about as concentrated as those who migrated earlier. However, the target regions of more recent migration waves are considerably different from those of earlier cohorts. This applies in particular to migrants from the NMS-8, where the different institutional regimes since accession have shifted the target country structure, which also affects the regional patterns of migration. Although the geographical concentration increased for more recent cohorts of migrants. from the NMS-8, the correlation of local concentrations across time is rather low and even insignificant for some CEE countries. However, a regression analysis shows that-even after controlling for geographic and economic characteristics of the regions-ethnic networks do play a significant role in explaining the location choice of migrants Cross-border commuting in the EU 27 in general is limited to individual border regions and has a relatively low magnitude when considering the overall European labour market. In the two years observed cross-border commuters accounted for only 0.5% of total employment in the EU. Cross-border commuting is of relevance in a small number of border regions, only. These are mostly located at the German-French and French-Belgian borders, on the Austro-German border, at the Czech-Slovak border, in the Baltic countries and in Western Hungary as well as the German-Polish border and potentially southern Sweden. These borders are mostly characterised by strong linguistic, historic or institutional ties. In these border regions usually slightly more than 1% of the employed commute across borders and in individual cases cross-border commuting may surpass the 5% mark. For most border regions outside these "hot spots" out-commuting is below 0.5% of the employed. There are also some differences in the importance of cross-border commuting between the EU 15 and NMS 12. In particular, NMS 12 countries receive much fewer cross-border commuters than EU 15 countries as a percentage of the employed in the country of work. In addition outbound cross-border commuting from the NMS 12 is strongly oriented towards the EU 15 countries rather than non-EU countries. By contrast, outbound crossborder commuting in the EU 15 is more strongly oriented to non-EU countries rather than to the NMS 12. Cross-border commuters - in contrast to internal commuters in the EU 27 - are also not necessarily better qualified than non-commuters and are drawn more than proportionately from manufacturing workers, males and the age group of the 20 to 29 year olds. These characteristics apply even more strongly to cross-border commuters from the NMS 12 than to commuters from the EU 15. While these results are largely consistent with the findings of earlier case studies in the literature, they also suggest that cross border commuters - in contrast to migrants - are not as strongly positively selected on educational criteria, but stem primarily from the intermediate qualification level. Finally, - while our results in this respect are subject to a rather unsatisfactory data situation, our findings also imply that after controlling for other influences on crossborder commuting - flows from the NMS 12 to the EU 15 are not significantly smaller than those among the EU 15 countries, while flows from the EU 15 to the NMS 12 are significantly lower than those among the EU 15. The primary difference in the factors determining cross-border migration in the NMS 12 and the EU 15 seems to be a closer association of cross-border commuting with the industrial specialisation in the NMS 12 than the EU 15. In our case study of the CENTROPE region we analyse migration and commuting potentials in the border regions of the new member states to Austria using two waves of a household survey conducted in the Austrian-Czech-Slovak-Hungarian border region in 2004-2005 and 2006-2007. 10.9% of the interviewed in the CENTROPE regions of the Czech Republic, Hungary or Slovakia expressed the wish to migrate to one of the EU 15 in the future (and thus belonged to the general migration potential). 3.8% of the population in the region were willing to migrate and had taken first steps to prepare for cross border migration or commuting. They belonged to the expected migration potential. 1.3% of the population applied for a work permit and or already had a job offer abroad (real migration potential) in 2006-2007. An additional 5.6% of the population in the region under consideration expressed the wish to commute to the EU 15 in the future (and belonged to the general commuting potential). 1.4% of the population in the region were willing to commute had taken first preparatory step. 0.8% of the population had applied for a work permit and/or already had a job abroad (real commuting potential) in 2006-2007. Relative to the first wave of interviews in 2004-2006 this represents a decrease in the migration potential of between 1.5 percentage points (general migration potentials) and 0.1 percentage points (real migration potential) of the population. Commuting potentials declined more strongly for the general and expected commuting potentials, while the real commuting potential increased slightly. A comparison with the Austrian subregions suggests that the general migration potential in Austria is as high as in the NMS-regions. 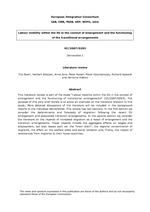 Analysing the determinants and structure of potential commuters and migrants suggests that, the presence of kids or a spouse in the household is a more serious impediment for the willingness to migrate than for the willingness to commute; gender differences in the willingness to commute are larger than for the willingness to migrate (although women are both significantly less willing to commute and to migrate), and the willingness to migrate reduces much more strongly with age than does the willingness to commute. Also both those willing to commute as well as those willing to migrate are disproportionately often drawn from the two extremes of the educational distribution, and are thus often either highly or less educated. When, however, including education in a multivariate regression analysis we find that education has no significant effect on both the willingness to migrate and to commute. This implies that potential migrants as well as potential commuters in the region considered are neither positively nor negatively selected. The willingness to commute also decreases much more rapidly with distance to the nearest potential workplace than the willingness to migrate while the latter is positively influenced by English and other foreign language knowledge. The willingness to commute is, however, more strongly associated with German language knowledge. In addition, the willingness to migrate is also more strongly influenced by the presence of networks and previous experience of working abroad than the willingness to commute. Analysing the changes in the preferences associated with the willingness to migrate and commute, our data suggests that the proportion of those willing to migrate to Germany and Austria is about 40% and thus substantially lower than in previous studies. On the other hand, the share of potential migrants preferring the United Kingdom is substantially higher than in the earlier literature. Those who prefer Austria do so mainly because of its geographical proximity and its high wage level. All other motives, such as language skills, resident family members, relatives or friends, education or training opportunities as well as the relative easiness of obtaining a residence or work permit speak for the UK.